More fourth-generation fighters, including the Sukhoi Su-35S, will be deployed to the Russian city of Komsomolsk-on-Amur in Khabarovsk Krai region near the Chinese border in response to the growing strength of Chinese, American and Japanese air power in the Far East, according to the Canadian-based Kanwa Defense Review operated by military analyst Andrei Chang also known as Pinkov. Through providing S-300 air defense missiles and a Yakovlev Yak-130 trainer to Belarus, Russia had solidified its buffer zone in Eastren Europe against NATO air power. At the same time, Russia is encouraging Belarus to purchase 18 decommissioned Sukhoi Su-30K fighters from the Indian Air Force; however, the magazine said that the situation in the Far East is very different from that in Eastern Europe. 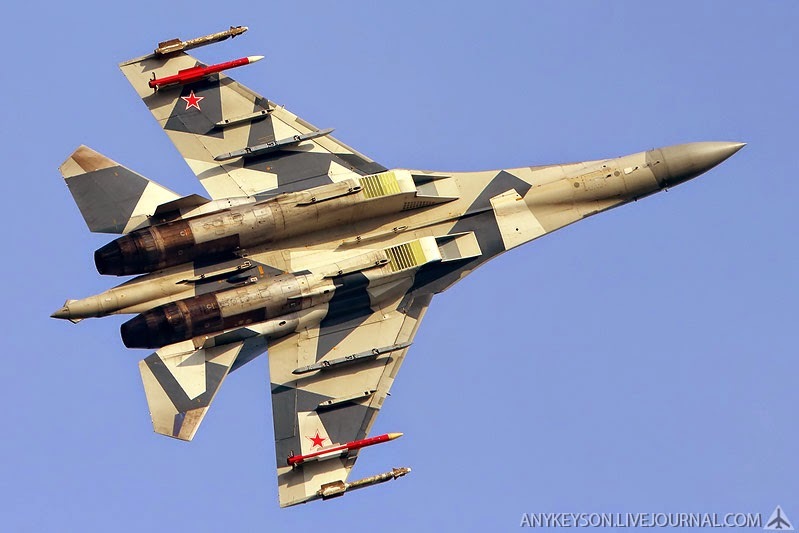 As the People's Liberation Army Air Force and the PLA Navy Air Force become more powerful in the Far East after introducing new aircraft, equipment, doctrine and training systems, the United States and Japan are no longer the only two potential threats to the airspace of Russia in the Far East, and for this reason, Moscow has decided to deploy more advanced fighters to the region, including Su-30SM, Su-30MKK, Su-33 and Su-35S aircraft, the report said. Komsomolsk-on-Amur is where the assembly lines for Su-30MKK, Su-33 and Su-35 fighters are located. For this reason, this region — only 300 kilometers from northeastern China's Heilongjiang province — is already in possession of many of Russia's most advanced fighters. Back in February, 12 Su-35S fighters were deployed to the 23rd Fighter Aviation Regiment at Dzemgi in Komsomolsk-on-Amur. The magazine said that 12 more Su-35S fighters are likely to be deployed to the region. Considered the most advanced fourth-generation fighter in Russia, the Su-35S is capable of fighting off three or four Su-27SK aircraft and Shenyang J-11 fighters of the PLA Air Force and Navy Air Force. In 2014, a total of 72 advanced fighters including 48 Su-27SM, 24 Su-35S are likely to be deployed to the area, despite Russia's strengthening of ties with China. The magazine said that the 6982nd Air Base located at Domna in Chita received the first 10 Su-30SM fighters to replace the older Su-25 attackers back in 2013.